MirraChrome represents the latest in Reflective Paint Coating Technology. It’s near microscopic particle content provides superior surface orientation. This particle alignment is the key to MirraChrome’s shine. MirraChrome can be used on any surface you can paint such as metals, plastics, wood, foams etc. From trim pieces and logos to full blown custom paintjobs the possibilities are endless even use it to touch up real chrome! Got a scratch in the worst place? Blend it away with MirraChrome. 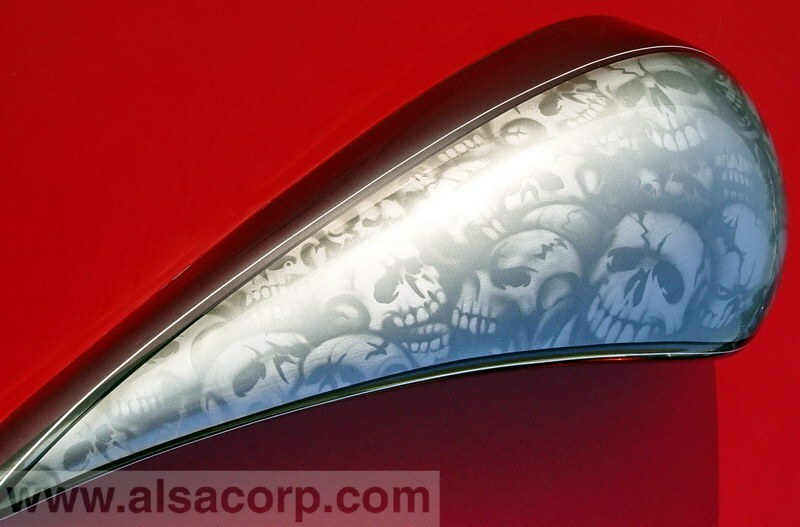 Ghost Chrome® Metallic Paint produces the most realistic Metallic Paint finishes available anywhere. Also available in an easy to use aerosol spray, anyone can reproduce the authentic look of real metal in minutes. Ghost Chrome® contains the smallest particle makeup of any metallic coating available. These extra small particles allow for a perfect orientation on the surface giving you the truest metal looks of any metallic paint available today. Certainly you’ve seen the spray paint with the perfect looking chrome cap on the shelf at the store, and maybe you even bought some, only to spray it and find out it’s simply silver paint. These companies use a “Real” chrome process on the caps in an attempt to deceive you into thinking you have bought something that will produce that result but when sprayed you see that it is not chrome at all, and far from Killer Chrome. If you really want to impress try combining Killer Chrome with ANY of Alsa’s other Killer Cans. Combinations are unlimited with things like Cobalt Blue Marble Chrome. There is no reason to stop at just chrome. You could even cover Killer Chrome with Crazer in a can (Black) then Candies in a can (Cobalt Blue) and the options are endless. MultiChrome brings you the best of both worlds a sprayable chrome paint combined with an intense prismatic color change effect. Simply dust this coating over a polished surface and watch it come to life. Use MultiChrome on your next show piece and make it truly a “One of a kind!”. When viewing MultiChrome from one angle you will see just chrome while changing your viewing angle will result in a prismatic color burst, UNLIKE ANYTHING YOU HAVE EVER SEEN.